Horses living outside will have daily care, including blanketing, fly masks/spray (depending on the weather), as well as grooming and hoof care. There are two feedings a day, and if you feel that your horse requires a noon time meal, we will be more than happy to accommodate that need. Stalled horses will get the same care as above. In summer, they will be out in the evening; during the colder months, they will be out during the day. Lay-up time for recovery from injuries and surgeries will include administration of prescribed therapies and medication, wound care, grooming and whatever is necessary for the quick and total recovery of your horse. Michele has a spring and fall vaccination program which she administers herself, to help keep costs down for horse owners. Verida Farm and Michele could not have better fit my needs for my retired gelding, especially as a person living across the country where I could not come to check on him very often. She would regularly send pictures and updates on how my guy was doing, and was such a compassionate, attentive caretaker and friend as we dealt with my older gent’s end of life stage. The horses’ needs under her care always come first, and she has a keen eye for all the small details that keep concerned horse owners awake at night. I could not recommend Michele and Verida Farm enough. From the first day I drove on to the property and Michele greeted me with open arms I knew I was making the best decision for my retired thoroughbred. There is no other farm like Verida! The care you will receive here is incomparable. Michele treats all the horses like they are her own. She is constantly in contact with me on a weekly basis to give me updates and photos on my horse. She comes with so much knowledge, and is always there when I need help! She gave so much time and patience to my horse when we integrated him from stall board to pasture board and into his new herd. No one would of taken that time and care to do what she did. They go above and beyond and even groom him even when he wants to be a Bay for the day! All in all, I never have to worry about my horse since he’s been at a Verida in Michele’s care. You won’t be disappointed. Michele Oren’s farm, Verida, is THE BEST! It is exactly what I was looking for, for my OTTB. (But thought it was too much to hope for). Verida goes the extra mile for your horse. The farm is clean, organized, and the aura is one of calm and serenity. The horses truly are cared for as if they are Michele’s own. Michele’s horsemanship is exemplary. I rave about Verida to my friends, and share the myriad of pictures Michele sends me of my boy. You are always welcome with open arms. If you want complete peace of mind regarding the care of your horse, Verida Farm is THE place. It is a GEM! What can I say about Verida Farm and its owner operator Michele Oren. 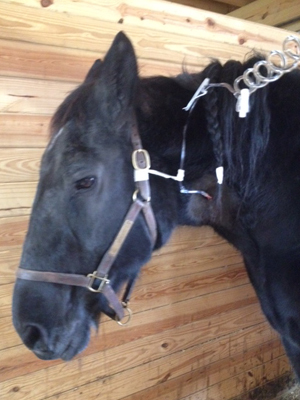 Verida Farm is exactly what our loved horse needed when he came down with a leg injury. The care and compassion he received at Verida went beyond our expectations. The stalls were exceptionally clean and bigger than expected. You, and your staff, are top notch. The way in which you go out of your way for the horses placed in your care speaks volumes to your love of what you do and the horses you care for. There is no question, if the need for boarding and/or rehabilitative care is ever needed in the future, Verida Farm is the only place we will consider. Thanks so much for taking care of Best Version, I am sure he will miss you, your staff and the farm. The summer 2016, I had no choice but to retire my horse due to chronic kissing spine pain. It was difficult to imagine him adjusting to a retirement setting, since he was accustomed to Show Barn life with limited turnout. Plus he was use to alot of activity, attention and daily pampering from me and the staff. When I set out to find a place for retirement, I called and looked at many place in various states. I found Verida on the internet and felt the website looked too good to be true. I visited Verida and met the owner, Michele Oren. Her place was not like any retirement facility I have ever seen. The barn and stalls so big, airy and clean, no flies (no kidding), horses looked peaceful, happy and healthy. Most important is how knowledgeable, hands-on, kind, and understanding Michele was to speak with, especially since this was a very hard decision for me. After seeing the facility and speaking with Michele my instincts told me she was the real deal, cared for all of the horses at her barn and understands each horse is unique (and their owner too). I do not even have words to describe how easily Michele made the transition for my horse (whose been with me for 15yrs) to his new home and routine at Verida. All I wanted was for him to be happy and Michele made that a reality due to her amazing care. Michele does exactly what she says she will do, on top of keeping the owner informed and sends amazing pictures. My horse looks happy and healthy, like all the other horses at her barn... even put on weight, which is big plus for hard keeper like him. That is a result of Michele's care that also includes feeding great hay & grain. I do not worry and can sleep at night knowing my horse is in Michele's care for his retirement..
After racing only 7 times Handy Andy bowed a tendon and was one of the lucky racehorses to end up at Exceller farm under the care of Michele Oren. With her care his tendon healed he was ready to be adopted. In 2005 I adopted him and he became a part of my family. After being hospitalized two times this past year and a hard recovery I knew it was necessary to retire him. I can tell you it was one of the hardest decisions I've ever had to make. My first and only thought for him was Michele and Verida Farm. I can rest now knowing he is in the best possible place for him and me. Michele Oren, owner of Verida Farms, is one of the most excellent horsewomen I have ever met. Her most profound gift to her clients’ animals is her patience. Too often, at other farms, people have lost patience with my special needs horse and she ended up getting punished for being afraid. Under Michele’s care, she has blossomed! Michele worked for weeks with her on her ear shyness and now accepts touch there with no problem. That was a painstaking process, and a real test of said patience! The peace of mind I have knowing that Michele is caring for my baby is priceless. All of Bella’s special needs are catered to here at Verida. Michele is excellent at handling Bella’s medical needs, administering eye drops daily among other needed treatments. She is also treated with special care due to her visual impairment. Michele is an experienced vet tech and monitors the health of the animals under her care closely. I am always notified promptly when something is potentially wrong with Bella (stiffness, swelling, fever). Michele also has an excellent working relationship with my vet. She is happy to schedule and met with my vet if I cannot come out myself. As well, Michele schedules and meets with the farrier, handles deworming, and even gives shots as needed. On top of Michele’s professional qualifications, she is also a nice, sane person to boot! The horses are all groomed daily and my mare’s skin condition has improved dramatically from this added service. Verida Farms is a huge asset to the area as, to my knowledge, there is nowhere else offering lay-up and rehab services like this. "I wanted to express my heartfelt appreciation and gratitude for everything you've done for my horses. I cannot tell you how comforting it is to know how well cared for they were while in your care. In fact, they were in better hands with you than if left alone with me considering your background as a vet tech!! I wouldn't change a thing about the way you run things - even if it was my own barn - everything was that perfect! I never had to worry about them while they were with you and I've never felt that way about leaving my horses anywhere!! I can't thank you enough." "I have been extremely happy with the care my pony has received at Verida Farm. As someone who has horses at home and knows what is the “right” way to care for horses, I am very impressed by the care that Michele and her staff provide. Michele sends me frequent updates and photos of my pony so I know how she is doing. And the facility is incredible – huge pasture turnouts, big run in sheds and everything is very clean and well cared for. I priced several facilities before I chose Verida and it was definitely the best facility at a very reasonable price. I highly recommend Verida Farm to anyone looking for a high quality, affordable barn that will provide a safe, caring home for your horse or pony." Thank you for taking such exceptional care of Hailey while she was at Verida Farm. It was the happiest and most relaxed I’ve known her to be in the 11 years I owned her." "After managing my own horse farm for nearly twenty years, I can honestly say that Michele Oren and Verida Farm are the most professional and competent group that I have ever come across. There are very few people I would trust to care for my retired show hunters. Like myself, they put the horses first and their knowledge, judgement and care for my horses is remarkable." "Michele and her staff at Verida have provided me with a comfort level I've never had before when boarding my 26 year old TB that I've owned for 21 years. To have found a boarding facility where I feel completely confident that my horse is receiving excellent care, care as good as my own, is something I have discovered at no place other than Verida. Michele's veterinary experience is such a valuable asset, especially in the care of the lay-ups and retired special needs horses such as my own. I am truly grateful for all that Michele and her staff do for my horse." "I made the decision to use Verida over many others based on the passion of Michelle for horses in general and her individual concern for my horse. Her resume in the horse business is impressive and her experience was obvious in all areas of care. I was not disappointed as Verida was everything I had hoped for and more. My horse received lots of TLC, was brought back to perfect health after a potential catastrophic injury and provided the best in vet care. All of this was accomplished at a very fair price with no hidden costs. I had a full confidence from the day she arrived that my horse always received the best possible care and that based on her experience, Michelle always knew what had to be done to get the best results. Since I love my horse, it mattered to me that she was happy on the farm. On my visits to see her it was clear that she was!!! A great experience in every regard and if the need arises again where I need this assistance, I will most definitely use Verida again." "Verida Farm is a welcoming, relaxing retreat for both horse and owner...how reassuring it is to know that your beloved horse is well-cared for! As many of us can relate to, many barns tell a good story, but simply don't deliver. Michele and the staff at Verida Farm take a personal interest in the care and well-being of all their horses, always keeping owners informed. It's such a pleasure to be welcomed with a warm smile and helping hand from the staff and canines alike...thanks for doing a great job!" Jo Anne and MJG's Supreme Scotch 'aka' Arizona! "My name is Painter’s Creek. I am a Thoroughbred Racehorse. I was one of five horses to win nine times in 2005. I was four years old. In the six years that I raced, I had 49 starts with 16 wins, 8 seconds, and 11 thirds. My great-grandfather was Seattle Slew. But I guess that wasn’t good enough!! When I was seven years old, they sent me off to Sugarcreek Ohio to be auctioned off and probably would be sent for slaughter in Mexico for human consumption. Fortunately, my trainer who liked me gave me to someone who took care of me until they could find a safe place for me to stay. They found a foster home for me in Ohio. Someone in New York State heard about my situation and began to pay my board to the foster home in Ohio. They were taking his money but they weren’t feeding me much. I lost close to one-third of my body weight; I was about 800 lbs. You could see all my ribs. When the man in New York found out I was suffering, he decided to bring me to New York so I could be closer to him and we could visit. Before you could say “THEY'RE OFF!”, I was in a trailer and on my way to New York. When I arrived at Verida Farm, I saw that the sign at the front gate had a heart wrapped around a horse and I knew I was in a good place. I was warmly greeted by Michele Oren, the owner of Verida Farm. I could tell right away that she knew all about horses and that she would help me with my health, especially my leg. She showed me to my stall, it was so nice that I laid down in the straw and rolled over and over, I was so excited!! Michele fed me really good food and took care of my leg. The Veterinarian checked me out and took X-rays. Michele and the veterinarian then set up a plan to bring me back to good health. Well, to make a long story short, in only four months, I was back to 1200 lbs, the lameness is gone, and I can run as fast as I want to. I wish that some of my other friends who were in trouble could have been saved and retired with me at Verida Farm. It is truly the best place I have ever been. I get fed twice a day and I get to go out every day and hang out with my friends. Michele is always there in case I need anything. She has a keen eye and can tell very quickly if anything is wrong with any of the horses on the farm. By the way, I finally met the man who brought me to Verida and we are having a great time together...LIFE IS GOOD!!!!! P.S. - Here are before and after shots of me...look what a difference four months at Verida Farm under Michele's care makes!" "My horses have been in the care of Michele Oren at Verida Farm for the past two years. Words can not explain our experience there...if they can't be home with me, there is no other place I would want them to be." Would you like additional information about Verida Farm? Call (845) 988-7717 today!